This glossy red fox peacefully slumbers while his fuzzy bunny friend keeps sentry. The pair were hand sculpted using both the pinch and slab methods, texturized with doilies, vintage buttons and fabric stamps collected over the years from yard sales and thrift shops. Frazier was brushed thoroughly with six coats of a layered combo of deep sienna and iron luster which created interesting light blue and purple areas within the grooves of his texture. A smooth oatmeal colored glaze was applied to his bunny friend. 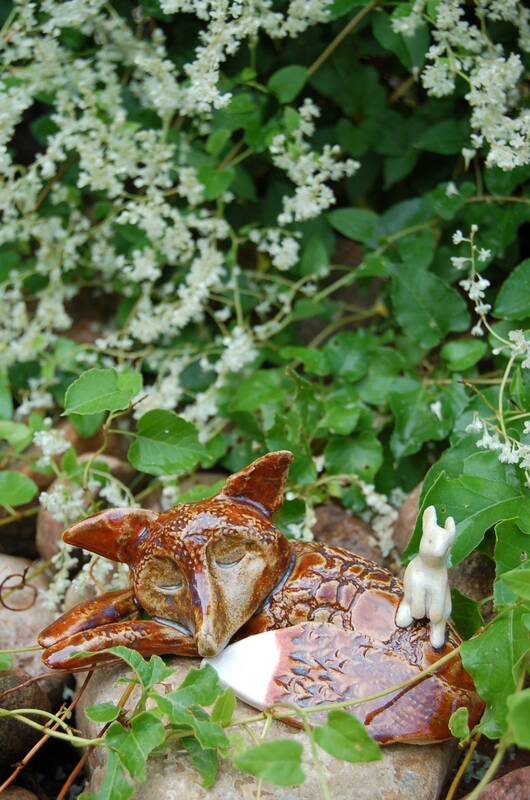 The tip of his tail was glazed with a white celadon as well as the cute cottontail on the rabbit's backside. 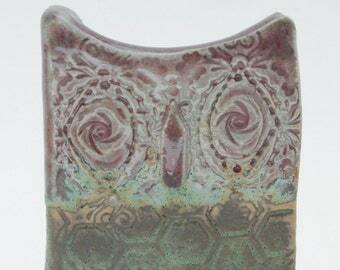 The piece was then fired to clay vitrification of cone 6 temperature. Frazier measures 3.25 inches tall, 6 inches long and 4.25 inches in overall depth. This sweet work of unique art would make a wonderful gift for that friend who has had your back through thick and thin. It would be an excellent nod of whimsy to any home or office, and also a perfect accent in a child's woodland themed bedroom.